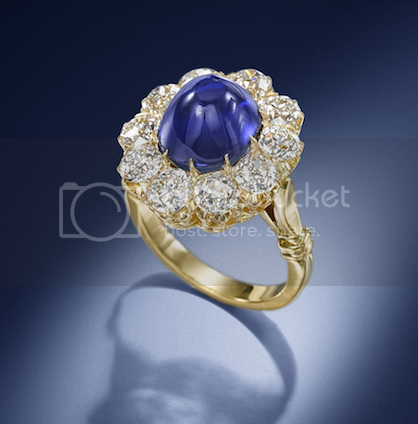 Top: a ring set with a cabochon-cut Kashmir sapphire, 7.13 carats, estimated at £50,000 to £70,000. 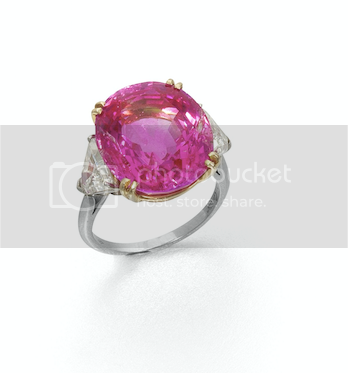 Below: A fine pink sapphire set in a Cartier ring, 17.15 carats, estimated at £30,000 to £40,000. DIAMONDS may be forever… but sapphires are soaring, at least when it comes to marking an engagement for increasing numbers of couples, according to Bonhams. The international auction house says a resurgence of interest in coloured stones has seen more and more couples choosing sapphires to affirm their commitment. While diamonds are seen by many couples as the time-honoured way of announcing their commitment, in fact they are a relatively recent custom compared to sapphires. Our modern-day love for “a girl’s best friend” is largely the result of a highly successful marketing campaign by De Beers in the 1930s and 1940s[i]. But Bonhams says many clients are looking for something a little bit different when it comes to the choice of gemstone for their engagement ring. While classic diamonds remain popular, the leading auctioneer is reporting a growing trend for people choosing coloured ‘statement stones’ like sapphires, rubies and emeralds. Sapphires come in a wide variety of colours – including pink, yellow and padparadscha (a rare pinkinsh orange colour) – and these hold a great appeal for serious jewellery collectors and investors. That means the stones are not only holding but increasing their value, making them an appealing buy in an otherwise increasingly volatile financial market. As ever, some of the interest is said to be the result of trend-setting celebrities leading the way. Hollywood actor Javier Bardem presented a three carat sapphire ring to actress Penelope Cruz to mark their engagement and Victoria Beckham has added a large oval cut sapphire to her collection of engagement rings. Actresses Tina Fey and Sofia Vergara both sparkled in sapphires on the red carpet at this year’s Oscars ceremony (see notes to editors for links to pictures). Jean Ghika, Head of jewellery in the UK and Europe at Bonhams, said: “Traditionally, sapphires symbolise truth, sincerity and faithfulness – so they make the perfect ingredients for an upcoming marriage. “Kings and queens from Ancient Greece and Rome wore sapphires to protect them from harm and envy, and they have enjoyed a reputation as one of the finest gems until the present day. “Our market data suggests more and more of our clients are opting for coloured ‘statement stones’ like sapphires, emeralds and rubies in their jewellery.” Jean Ghika continues: “While the market will always be there for diamonds, our global clients are interested in seeing more pieces with colour and adding sapphires into their jewellery collection. Part of the growing interest in coloured stones is due to the renewed supply of material, and also rejuvenated mining activities in traditional areas. While the older material typically achieves the higher prices at auction, Bonhams reports the price for new material is also increasing as customers recognise supplies are finite. Bonhams is seeing superb examples of coloured stones coming on to the market due to the rising demand for colour in jewellery across the gemstone board. New mines are opening in countries like Mozambique, Madagascar and Zambia and these areas now produce beautiful sapphires, rubies and emeralds. Such increased interest in coloured stones is behind a significant surge in auction room prices for new and period jewellery featuring the gems, which makes 2016 a strong year for anyone who wants to sell sapphires which are sitting in safe deposit boxes or in dusty old jewellery boxes. Jean Ghika says: “With prices so buoyant, now is a really good time to sell sapphires and other coloured stones. We encourage clients to look in their jewellery boxes and safety deposit boxes and bring in any pieces they simple don’t wear anymore for a free valuation with a view to sale. They will get our expert advice on how to achieve the best price and may be surprised at the current value of their sapphires given demand for the best quality stones is very high. Sapphires hailing from Kashmir – which display a vivid velvety blue tone unique to the region – are among the most highly-prized gems for serious collectors and investors due to their rarity and their scarcity. This is due to the fact that while there are still sapphires to be found in Burma and Sri Lanka, no mining activity takes place in Kashmir due to the depletion of the mine in the 1880s. Today Kashmir sapphires are amongst the rarest of all gemstones and are avidly sought by collectors who are prepared to pay princely sums for top-quality specimens. Bonhams has seen many sapphires dramatically exceeding pre-sale estimates at auction, demonstrating a rapidly strengthening market. There are numerous examples of significant price increases at auction of the last five to ten years. In 2004, a 30-carat Sri Lankan sapphire sold at Bonhams London for £11,950. A decade later, a similar Sri Lankan stone, also weighing 30 carats, sold for a staggering £326,500 – an increase of 2,200 per cent. In April 2015, a ring set with a Kashmir sapphire weighing 21.27 carats and carrying a pre-sale estimate of £50,000 to £80,000 sold at Bonhams for a stunning £290,500. In December 2015, a pair of 19th century earrings set with Kashmir sapphires that belonged to a European princess and weighing a little less than eight carats each sold for £1,538,500 – more than tripling their pre-sale estimate of £500,000. At Bonhams New York in December 2015, an oval-cut Kashmir sapphire weighing 7.84 carats and set in a ring by Tiffany & Co sold for a staggering $1.3million [nearly £918,000], breaking the world record for a sapphire under 10 carats. In April 2014, Bonhams London sold a Sri Lankan yellow sapphire weighing 86.32 carats for £60,000 – six times its high pre-sale estimate. Sapphires boasting optical effects can also attract much interest at auction. These include ‘star sapphires’, which are cabochon-cut [shaped rather than faceted] stones that portray a star-like effect called asterism on the surface, caused by light reflecting from numerous tiny inclusions in the stone. In September 2014, a star sapphire weighing 83.98 carats made £52,500 against a pre-sale estimate of £15,000 to 20,000. Recent results at Bonhams demonstrate the global appeal of the stone with the auctioneer reporting its top sapphires being purchased from its London Fine Jewellery sales by buyers coming from the US, Canada, Europe, Hong Kong and South Korea. As a result, Bonhams is expecting greater interest in its upcoming Fine Jewellery sale in London which takes place in its New Bond Street salesroom on 20 April. This features over 20 sapphire lots including a ring set with a cabochon-cut Kashmir sapphire, weighing 7.13 carats, estimated at £50,000 to £70,000. There is also a fine pink sapphire set in a Cartier ring, which weighs 17.15 carats and is estimated at £30,000 to £40,000. Bonhams Fine Jewellery sale takes place at midday on Wednesday 20 April in its New Bond Street salesroom. Follow Bonhams on: Twitter @bonhams1793, Facebook: https://www.facebook.com/bonhams1793 and on Instagram @bonhamsjewels.